Alex Hetherington's review of Ally Wallace's Giacomo residency and exhibition. Dunfermline Carnegie Library & Galleries, until 24th March, 2019. All photographs by Ally Wallace, unless otherwise credited. 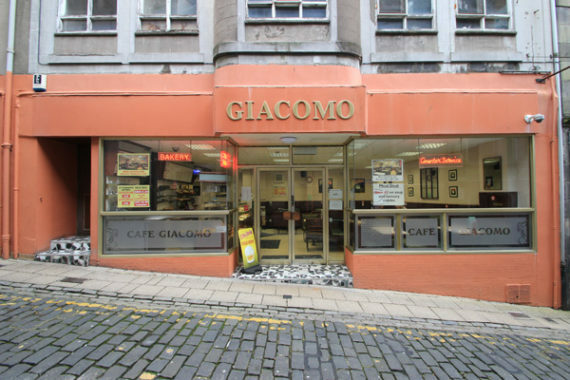 The subject of artist Ally Wallace’s new work, Café Giacomo, is a time-locked, glass-fronted popular café, which has been in operation since 1958, and the grey art deco-styled building that houses it, residing on a narrow street, Cross Wynd, in the centre of Dunfermline, Fife. First by encountering its architectural details, surfaces and volumes, Wallace then traces its preceding, hidden human histories, back as far as the 1920s when the site was run as the Trocadero, a café established by Italian immigrants, and speaks about its present-day clientele who liken its traditional rooms to a kind of familiar and vital retreat, community centre through habit, a perennial meeting place. 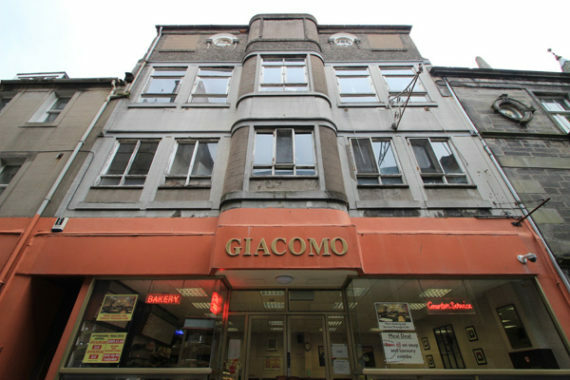 Café Giacomo is a gorgeous and ostentatious place. Its exterior is painted in a bright coral and is a mixture of matt gold fixtures and beaming red neon signs. 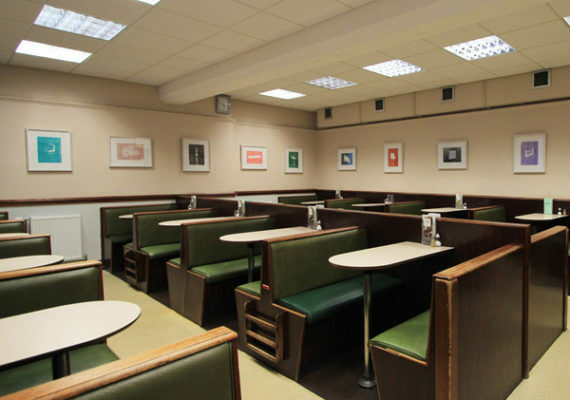 While its interior comprises dark brown wood laminate formica 1960s booth seating with faux leather upholstery in ivy green, overhead fluorescent lighting, speckled sheet vinyl flooring, curved glass display cabinets with baked goods on trays, filled with cream, fudge, caramel, icing, hundreds and thousands; and a warm air filled with steam and voices, and out-of-place songs from the radio. Along the reach of the building is the business’ name in period-style typeface while its elevation, as the eye travels upwards, sees a grey utilitarian facade, with a central windowed flute-like column, while two circular windows form the building’s ocular diadem. Inside, we climb a black-and-white art deco ceramic tile and wooden stairwell (with carved love hearts), in the non-public part of the building, past a bakery on the first floor, reaching upper levels which become progressively decayed, spaces without purpose apart from recording disrepair; a residential apartment to one side, now used as offices and storage makes known its former domestic purpose – family name door plate, bell chimes, floral wallpaper, glimpses of erstwhile comfort, all in stasis, while time, 1920s, 1950s, 1970s, 2019, are all passing through. 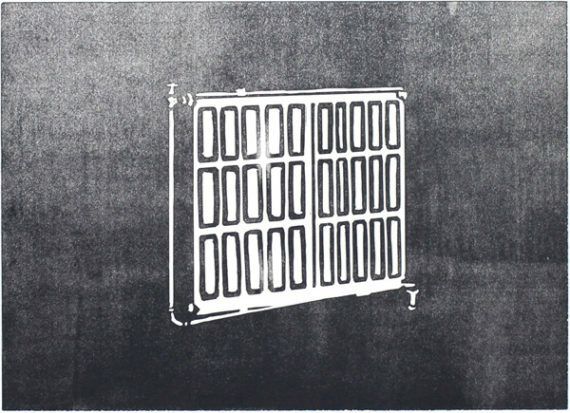 Wallace responds with curiosity to different kinds of architectural space, often autobiographically-nuanced. He combines the diligence required of the field study, and the quiet eye of the in-situ observer, the site-specific, documentarian, artist-in-residence. I often think of Wallace’s work, in the moment and out of it, as visual journalism and part memoir. 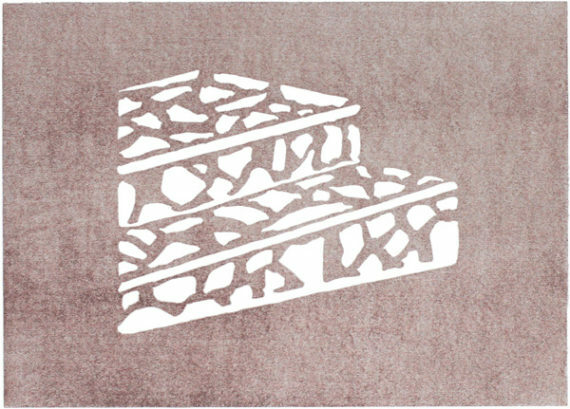 With an accessible and diaristic sensibility he studies the symbiosis between an architectural environment and its inhabitants, reporting on its relations and rhythms – human stories that give voice to a space’s substance: the spectrum between commonplace and unique and extraordinary. A place, like Dunfermline, where peacocks enjoy ‘Freedom of the City’ status. 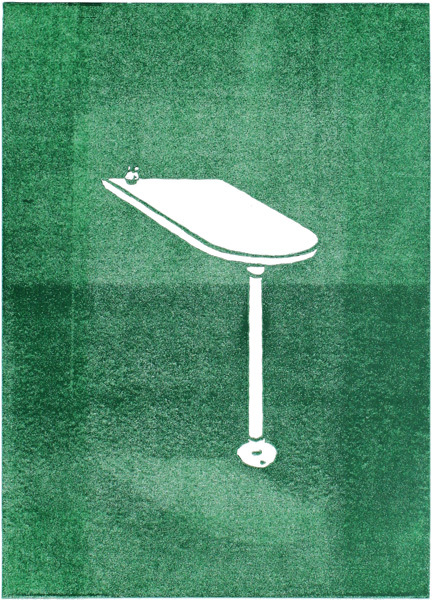 Wallace’s experience as informal artist in residence at Giacomo’s, during 2018, was distilled into a suite of colourful framed prints, ink drawings and a short video first exhibited at the café itself; how the objects – tables, fixtures, radiators and such – in the space correspond to their simplified, abstract likenesses set on the wall; I think about how these two aesthetics parallel. 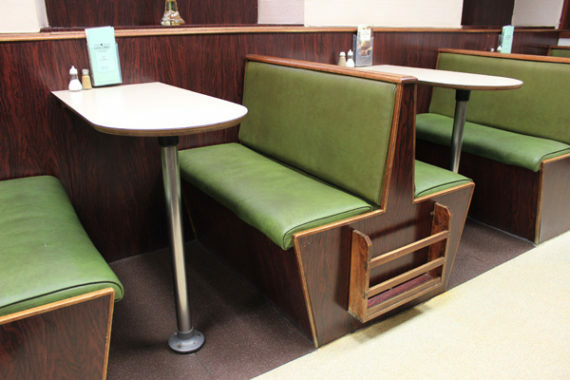 Looking now at the documentation, I enjoy seeing the the peaks and troughs of the assembled booth seating, it reminds me of the rhythms or pulse of the space. 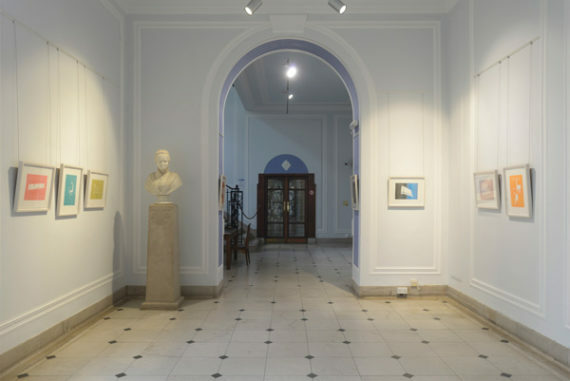 In turn the exhibition was transported to a handsome former entrance space at Dunfermline Carnegie Library and Galleries, showing from 12/1/19 until 24/3/19. This Victorian interior with tall, slender windows and a repetition of arches and diamonds, sitting alongside decorative and functional features, replaces the café’s noise and footfall and provides an interval to consider its elements, spaces and details in Wallace’s restrained silhouette, in negative space drawings, in here-and-not-here forms, Giacomo’s minutiae emerging from flat planes of grey, green, purple, orange: a window frame revealed through a black to blue graded span or a rack for storing trays embossed in purple. These egalitarian, unmonumental moments are installed, in revealing contradiction, next to a marble bust set on an ornate plinth of Margaret Carnegie, mother of Scots-born American industrialist Andrew Carnegie whose fortune in railroads, telegraphy and steel paid for the building. Thoughts on comparisons fill an afternoon-long conversation with the artist, during the course of which I am reminded of moving image artist Helen McCrorie’s work about the flood that took place at the confluence of three rivers near her home in Perthshire and her study on photographs, like memories, lost in the waters; Maria Fusco’s Master Rock, a drama and radio play which takes place in the power station, deep within the hollowed-out mountain of Ben Cruachan, in the west of Scotland, making the hidden apparent, and American Harvey Quaytman’s abstractions, minimalist sculptural paintings rendered in geometric forms and simple colours which encapsulate poetic transient observations. I think about the dual animated and archival project Wallace is creating over time, his excursionist activities criss-crossing private and public spaces across Scotland from rehearsal rooms to working power stations and seaside pavilions to universities and former schools, about the collective materials, character and conditions he draws out from a space, and how the work comes to understand the complexities of the past revealed in the details of the present moment. It reminds us that we do not exist apart from our surroundings and its histories, that we are the continuity of its perpetual authoring. 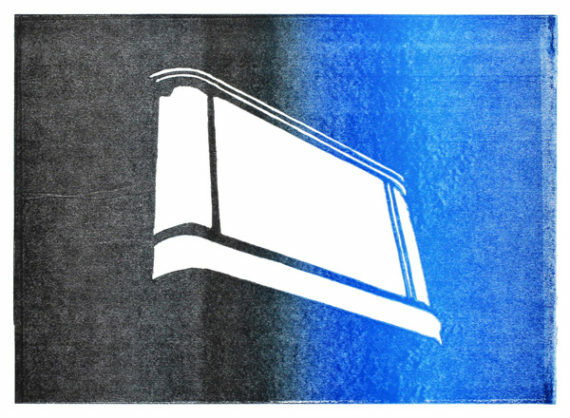 Alex Hetherington is an artist, writer and curator based in Stirling.